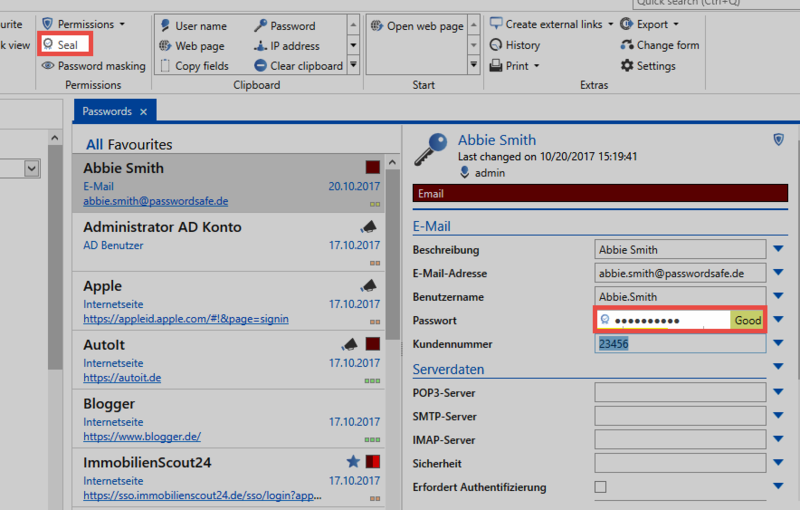 Users with the required permissions to issue the releases receive access to the current state of the existing seals at any time via the seal overview. The overview is accessible via the ribbon as well as via the icon in the password field of the reading pane. If a data record for a user * is sealed *, the user is prevented from seeing the password by the seal. This also corresponds to the condition when a seal has been newly installed. By resetting a request via the icon at the right edge of the screen, current requests from individual users are also returned to the “sealed” state. If a user has requested a release, it is in the release process. This status is highlighted by a corresponding icon next to the user name, since a possible release can be actively granted by the authorized user. After these so-called * important entries * can also be filtered in the headline of the seal overview in the same named rider. 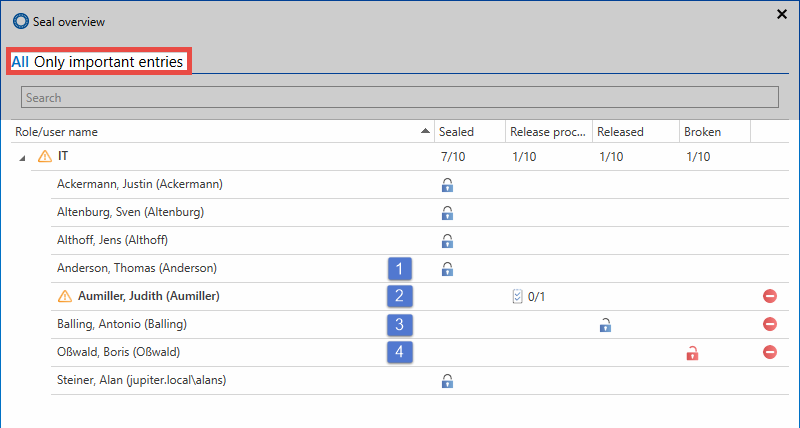 The maximum duration of an release request can be configured in the advanced seal settings. If the deadline has elapsed without sufficient releases being made, the request is deleted and the state “sealed” is restored. If a release is granted, a seal is approved as * released *. The maximum duration of a granted release can be limited in the advanced seal settings. The user then has, for example, 24 hours to accept the release and break the seal. The actual * seal breach * is obtained by acquiring knowledge of the release and by actively breaking the seal after a security query. Viewing the password is irrelevant. Once broken seals can be manually reset by the icon to the right of the broken seal column. The state “Sealed” is restored. !It makes no logical sense to re-seal already visible passwords. The user was able to view the password. Therefore, it is not monitorable whether the password has been saved, for example, by screenshot. In such cases, a new password is the only way to guarantee 100% password security!